This video explores these shifts and offers five concepts that will improve the performance of any leader. The concept of leadership is changing. What we used to believe about leaders has shifted. 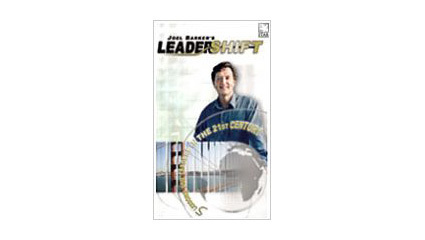 Joel Barker’s video program Leadershift: Five Lessons for Leaders in the 21st Century is about understanding this change – this leadershift. The video explores these shifts and offers five concepts that will improve the performance of any leader. Using bridge-building as a metaphor, futurist Joel Barker takes you to numerous locations illustrating how a leader is a bridge builder. Building safe, wide, inviting bridges for all to cross… bridges built of hope and ideas and opportunities. Bridges that help us move from where we are to where we need to be. The video asks viewers to question why leadership is important to them, and asks them to consider the definition of a leader in the 21st century: someone you would follow to a place you would not go by yourself. It also teaches that the characteristics of a “leader” never change. Incorporating inspiring locations and vivid stories, Leadershift motivates every leader, and aspiring leader, to develop the skills needed to lead his or her organization into the 21st century. Focus the majority of your efforts on the future. Understand the nature of fundamental change. Appreciate complex systems and how they work. Examine your leadership style to see how it effects productivity. Create shared vision to build bridges to the future.